Want to encourage children to enjoy reading and books? Try this two-pronged approach. Buy books for kids. Give books as gifts. Why? Owning an age-appropriate book means the child will be able to return to it again and again, allowing him or her to become comfortable with it. Ownership allows children to make friends with books. Books don’t have to be expensive. Plenty of used book stores, library sales, and discount chains offer inexpensive children’s books. Connect reading with some enjoyable and memorable activities. Look at the child’s passions and learning styles, and explore them using the book as an inspiration. There are many, many suggestions for activities to tie-in with books online, especially on Pinterest (Buggy and Buddy have over 500 pins). Let’s use Extra Yarn by Mac Barnett and illustrated by Jon Klassen as an example. Extra Yarn is a picture book about a young girl who finds a box of yarn. It looks like an ordinary box, but when she begins to use the yarn, amazing things happen. It is a complex, layered story that will appeal to a wide range of readers. It is also a Caldecott Honor Book, so expect imaginative, creative illustrations. Some of us love paper books and others swear by our ebook readers. Still others enjoy listening to a book. Unsure which to choose? Encourage a child to explore all the different ways to enjoy a book. Be sure to include audio options. In addition to reading the book aloud in person, look for videos of people reading children’s books like the one below. It might be fun to compare how different people read. Does the reader pronounce any of the words differently? What about rhythm? Are some readers faster or slower? Which do you prefer? The story begs to be accompanied with some colorful skeins of yarn to be used for projects. My grandmother taught me how to make these when I was a child. 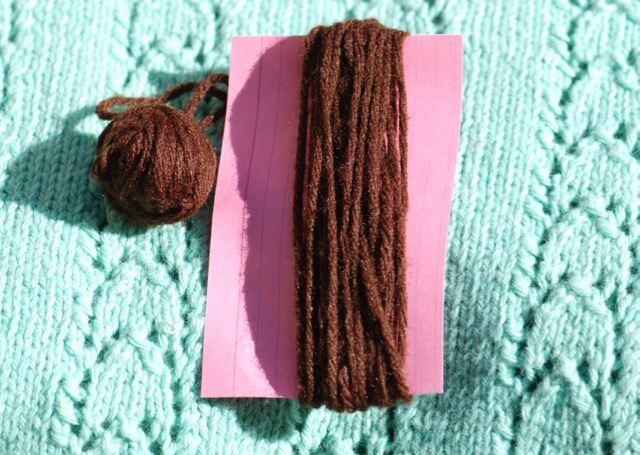 If you are using an index card, line up the end of the yarn with edge of the card (middle of 3 inch side). This will be called the lower edge. Gently wrap the yarn around the center of the card the long way about 25 to 30 times. The yarn should be snug, but not so tight that it bends the card. Keep the tension as even as possible so all the wraps are the same length. When finished, cut the yarn at the lower edge. 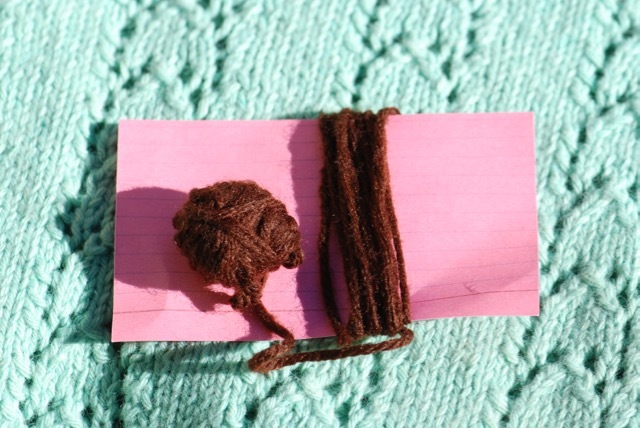 Next, cut a piece of yarn about five inches long. 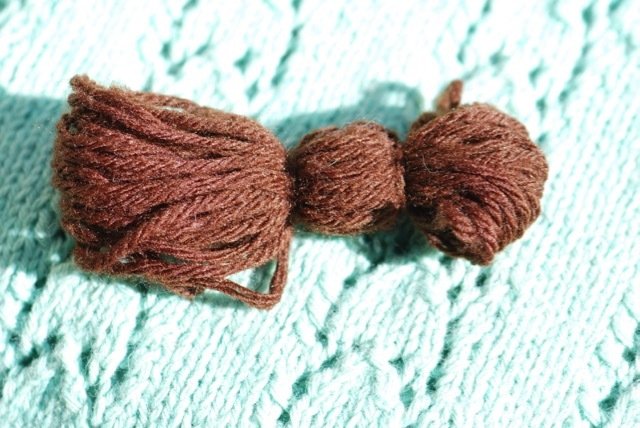 It can be the same color yarn or a contrasting color. Slip the index card out of the yarn wrap, keeping the yarn as a bundle. Cut another piece of yarn about five inches long. 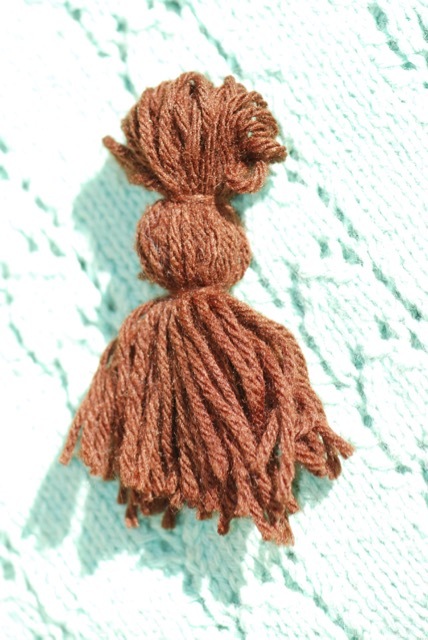 Tie this piece around the bundle about an inch from the top knot. This forms the head. Tie another cut piece of yard about 1 to 1 1/2 inches below the head. That will form the body. Now you have some choices. You can cut through the yarn at the lower edge to form a skirt. (If you have ever made tassels, this is similar.) That can be the finished look. 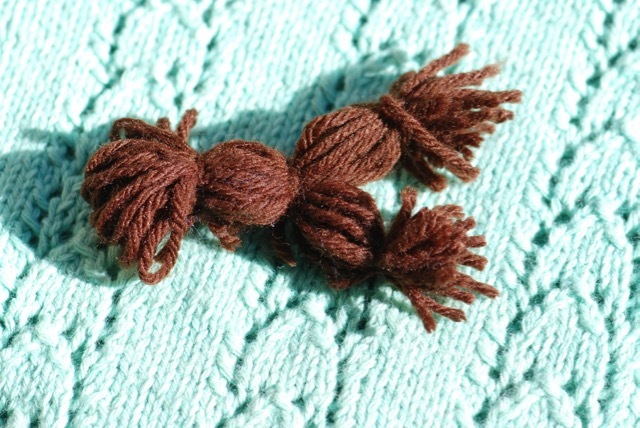 You can also separate the lower edge yarn into two “legs” and tie the “feet” with two piece of yarn. To make arms, wrap yarn as you did above, but this time wrap around in the short part of the card. 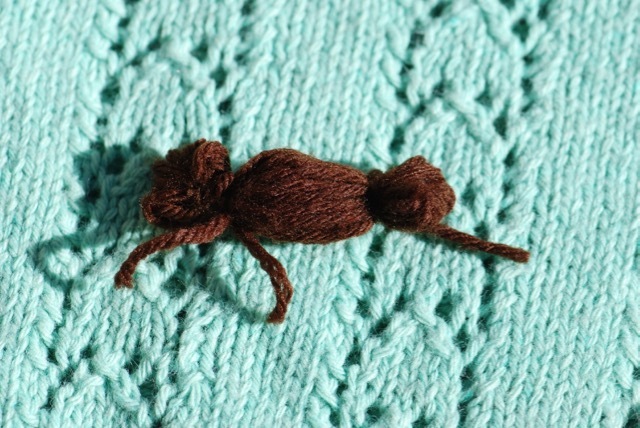 Now slip the arms through the body of the doll by poking your finger in to separate the yarn roughly in half and then feeding the arms into the hole. The arms should be perpendicular to the body. 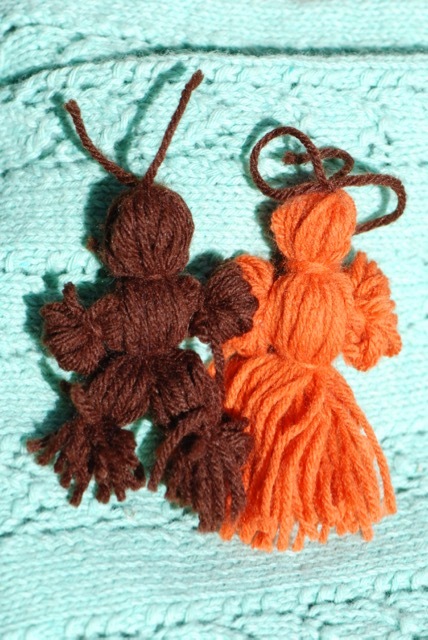 Finish the dolls by tidying up the tie pieces (cut them close to the knots), adding hair, googly eyes, etc. Cut a frame out of the tag board, creating a size appropriate for the age of the children you are working with. 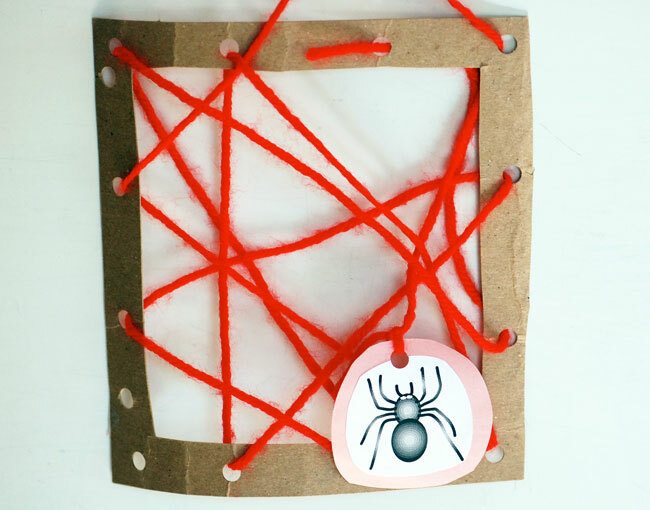 Make holes in the frame with a hole punch. Now have the child weave and wrap by placing yarn through the holes. 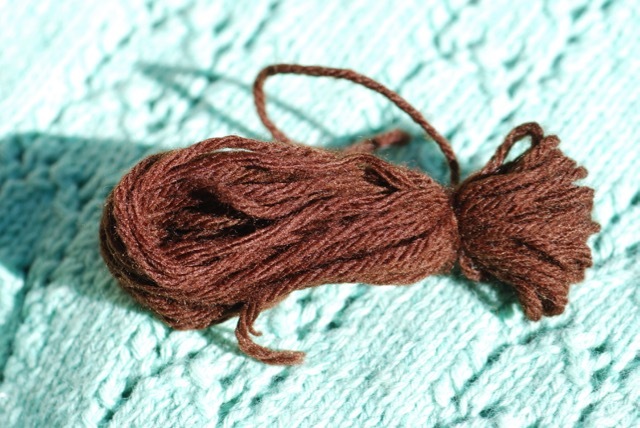 Note: Rolling a small piece of tape around the yarn at the leading end will make it easier to slip through the holes (like the aglet of a shoelace). For this one, we mimicked a spider web. Can be extended by adding different yarn colors. Kids also enjoy exploring yarn by wrapping it around kitchen chairs, trees, etc. 4. Teach older kids how to knit or crochet. If you don’t know how to knit or crochet yourself, check some of the many how-to videos. 5. Research how yarn is made and where the raw materials come from. One of our favorite picture books on this topic is Farmer Brown Shears His Sheep: A Yarn About Wool by Teri Sloat. All this was inspired by Extra Yarn by Mac Barnett and illustrated by Jon Klassen. 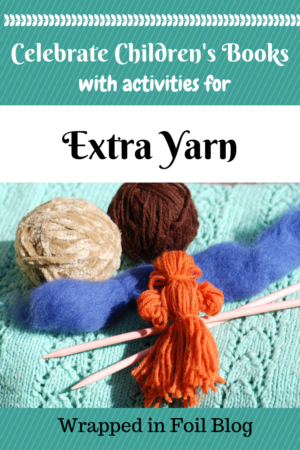 Have you ever shared Extra Yarn with a child? Do you have any activity suggestions to extend this book?